Stinky, broken, or just plain old... all gear will eventually wear out. How do you know if your gear is past it's prime? Track the number of rounds you log each sparring session to get the most accurate record of minutes they are used. Once you notice the soles breaking down, coming loose from upper portion of the shoe or the ankle support loosening, you may want to replace them to prevent potential rolled-ankles or foot injuries. MAINTENANCE TIPS: Do not use boxing shoes and running shoes interchangeably. The lightweight sole and materials of boxing shoes are not made for hard surfaces or outdoor conditions. Using them outside of the ring or on non-padded surfaces will wear the shoes more quickly and reduce the support they provide. Track the number of rounds you log each workout to get the most accurate record of minutes they are used. Once you notice that the padding is smashed or you can feel more impact on your knuckles, through the glove, you may want to replace them to prevent potential hand injuries. MAINTENANCE TIPS: Do not use bag gloves and sparring gloves interchangeably. The harder surface of the bags you are hitting, breaks down the foam in sparring gloves more quickly. 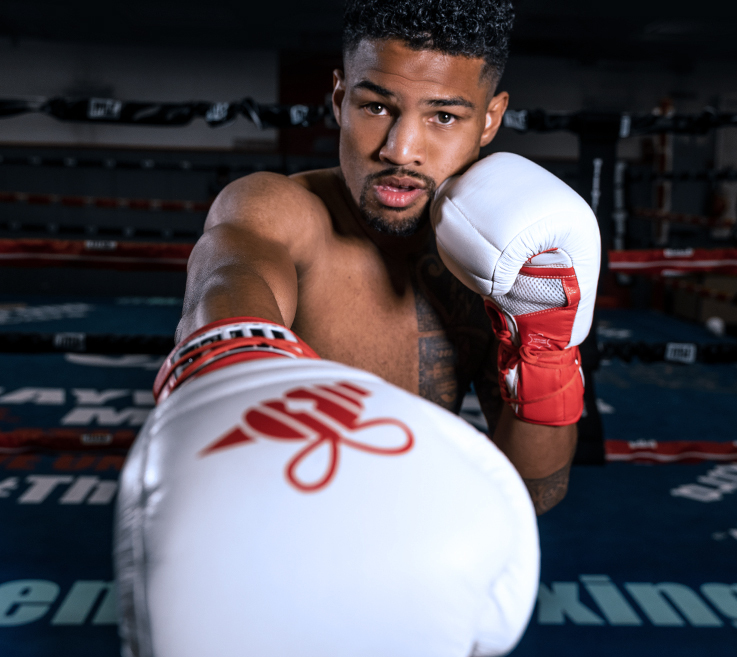 It also creates a rougher surface and potentially embeds small particles of material into the striking surface of the gloves that you are then hitting a sparring partner with. Sparring Gloves should be replaced every 6 months depending on frequency of use (assuming they are being used 2-3 times per week.) Three times per week, 4 weeks a month, 6 months = approximately 72 rounds. If you notice that the leather or material around the knuckle is cracking or showing excessive amount of wear, replace them sooner for safer contact. You should always feel at least 1.5-2” of padding across the knuckle. With additional wear and contact, the foam will break down more quickly and should be replaced. MAINTENANCE TIPS: To extend the life of your sparring gloves, clean them after each use. By removing the excess body oils, sweat and salts that break down the leather and foam construction, you’ll get better quality use from your gloves. Also allow them to dry thoroughly between each workout to prevent build-up of potential mold, mildew and bacteria. Wraps should be replaced every 4-5 months depending on frequency of use and how well you maintain them. If you let them dry-out thoroughly after each workout, wash them regularly (after every third session) and keep them free from snags and tears, you should able to get some life out of your wraps. MAINTENANCE TIPS: Do not roll wet hand wraps up and toss them in your gym bag. Let them dry completely before rolling them up for your next work out. Keeping them clean and replacing them more often will also, in turn, extend the life of you gloves. Having fresh and new wraps will help keep your gloves free from bacteria, potential mold and mildew. Rotating your hand wraps out more often will pay dividends in making your gloves last longer and remain free from odor. Your head guard should be replaced every 9 months depending on frequency of use (assuming it is being used 2-3 times per week.) Three times per week, 4 weeks a month, 9 months = approximately 108 rounds. MAINTENANCE TIPS: To extend the life of your head gear, clean it after each use. By removing the excess body oils, sweat, hair products that break down the leather, interior fabric and foam construction, you’ll get better quality wear from your head guard. Also, allow it to dry thoroughly between each workout to prevent mildew, bacteria and moldy conditions.